← What happened at OJHRI CAMP in Rawalpindi in 1988. 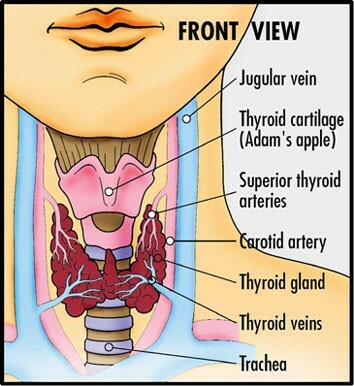 All of us have a small gland in our necks called the Thyroid gland. Normally it is not visible and we cannot feel its presence inside us. It sits comfortably in its bed and does a lot of good to us through its excretions (hormone) which are synthesized by Iodine. These hormones are essential for the function of every cell in the body. They help regulate growth and the rate of chemical reactions (metabolism), and are involved in the circadian rhythms that govern sleep, among other essential functions. Optimum human health is not possible without adequate supply of Thyroid hormones. So this small gland which is not seen by others and is not felt by ourselves is critical to our health. That is why the over production of these hormones causes a disease called Hyperthyroidism which is our topic in this blog. The two most important thyroid hormones are thyroxine (T4) and triiodothyronine (T3), and Thyroid stimulating hormone (TSH), which is produced by the pituitary gland in the brain. The thyroid also makes the hormone Calcitonin, which is involved in calcium metabolization and stimulating bone cells to add calcium to bone. It is the same Iodine which is presentin Sea weed, Fish (Cod, Shrimp and Tuna etc), milk, Corn, Prunes, Banana, Cheese, Cereal, Apple juice, and some vegetables. If the level of Iodine drops in our blood and remains low for prolonged period of time we can have enlargement of thyroid gland (also called as Goiter) or a disease Hypothyroidism (we will talk about it in another blog). Remember it is the lack of Iodine in the diet which causes the Thyroid gland to swell. Goiter or swollen Thyroid gland. The Goiter shown in this picture is pretty large and usually represents very long standing Iodine deficiency. But sizes even greater than this are a pretty common site in some areas of the world where the Iodine content of the water is below normal. Use of table salt containing Iodine is therefore advised in such areas. Please remember that some young females have what is called as Physiological Goiter. That is small, diffuse enlargement of thyroid gland in menstruation and pregnancy. This condition is mostly self limiting and is mainly due to hormonal changes in the body.You can have hyperthyroidism with or without thyroid gland swelling. The risk factors for development of hyperthyroidism or Graves’ disease include personal or family history of thyroid or autoimmune disease, recent pregnancy, and exposure to Iodine, among other factors. Women are affected by this illness 8 times more than men. So it can be said that this is predominantly a disease of women. The riskiest age for developing Graves’ disease and hyperthyroidism is between 20 and 40. Pregnancy and the year after childbirth are both times of greater risk for this disease. There is an increased risk of Graves’ disease in smokers. 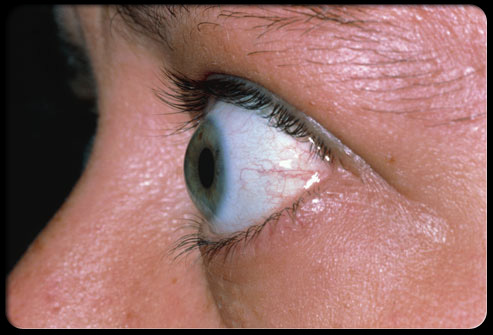 Smokers with this disease tend to have more severe symptoms like thyroid Opthalmopathy feature (the prominent eye problems or the protrusion of eye balls) that are more resistant to treatment. Some treatments and medications can trigger Graves’ disease and/or thyrotoxicosis in some people, including: Interferon Beta-1b and Interleukin-4, immunosuppressant therapy for Hepatitis, antiretroviral treatment for AIDS, and lithium, widely used to treat Depression and Manic Depressive illness. There are two particular treatments that are known triggers hyperthyroidism: a third of patients receiving monoclonal antibody (Campath-1H) therapy for multiple sclerosis (MS) develop Graves’ disease within six months, and receiving a donated organ or bone marrow transplant from someone with Graves’ disease can also cause the disease in the recipient. Talking of risk factors in the production of hyperthyroidism it may be kept in mind that Stress is a factor that appears to trigger the onset of Graves’ disease in some patients. There is a definite connection between major life stressors – i.e., death of a spouse or close family relative/ friend, divorce or separation, loss of a job, major accident/personal injury, moving, marriage – and the onset of this disease. * Difficulty in falling sleep. * Staring eyes (Hyperthyroid Opthalmopathy). Older adults are more likely to have either no signs or symptoms or some very subtle ones, such as an increased heart rate, heat intolerance and a tendency to become tired easily. Medications called beta blockers, which are used to treat high blood pressure and other conditions, can mask many of the signs of hyperthyroidism. So never use any medication unless your doctor has prescribed it after careful evaluation of your symptoms and with the help of available laboratory tests. Prompt diagnosis and treatment of hyperthyroidism can lead to a good prognosis or a cure in some cases. With regular medical care and compliance with treatment plans, most of the people with the disease live active, normal lives. It may be emphasized that patients with hyperthyroidism may need Radio active Iodine treatment (also called as medical thyroidectomy), surgery (removal of the whole or part of the thyroid gland), and various drugs to be taken for considerable periods of time. At the end of which, you should be sure, that even if it is not completely cured, your life will be as near normal as possible and you will enjoy all the activities of a normal healthy being. Hyperthyroidism can lead to serious, potentially life-threatening symptoms and complications, such as cardiac arrhythmias and heart failure. Seek immediate medical care if you, or someone you are with, have symptoms such as unexplained weight loss, hair loss, frequent bowel movements, excessive sweating, weakness, joint and body pains and aches, tachycardia (palpitations), heat intolerance, irritability, anxiety, irregular periods / excessive bleeding (in women only), loss of hair, loss of sleep, chest pain, or shortness of breath. If you have any suggestions / questions please feel free to ask here. This entry was posted in CurrentAffairs, Disease, education, Hyperthyroidism / Toxic Goiter, Medicine / Health / Glands / Neck, Pain, Pakistan, Uncategorized and tagged Anxiety, arrythmia, body and joint pains, bulging eyes, chest pain, Excess hormones, exopthalmous, Goiter, Graves disease, heat intolerance, hyperthyroidism, Iodine, iodine 131, Irritability, medicine, menses, miscarraige, Neck, nuclear medicine, palpitations, prominent eyes, radioisotope, radionuclide, shortness of breath, T3, T4, tachycardia, Thyroid, Thyroid Disease, Thyroid hormones, Toxic goiter, TSH, weight loss. Bookmark the permalink. 9 Responses to How do I know I have Hyperthyroidism: (Grave’s disease or Toxic goiter)? HELLOW im chelle i want to know the food to eat because i have a hyperthyroidism the TSH is low what should i do? My mother having hyperthyroidism. What are the treatments for this?? She certainly having chest pain and neck pain. .
You should consult an Endocrinologist at the earliest. Having chest pain is not a very good sign. The treatment can be with medicines, a radioactive Iodine dose or surgical. Depends upon the condition of the patient and severity of the disease. Good luck. Thanks for stopping by. In my opinion you should keep seeing your Thyroid doctor as the hormone levels tend to change in Hashimoto’s thyroiditis. In some cases it may give rise to Hypothyroidism (as is the case with you). Also please be regular in taking the replacement therapy you have been given otherwise a lot of complication can arise. Best wishes and good luck. Hope you are in good health by the grace of Almighty Allah. My name is Haseeb Ahmed i am 35 years old. i loss my weighty from 85 kg to 70 kg since 3 to 4 months my color completion going to dark day by day Doctor suggest thyroid T3, t4 and TSH results are t3 2.23 T4 15.6 and TSH 0.49.is it perfect report if not then what i do.i want meet you please tell your address.